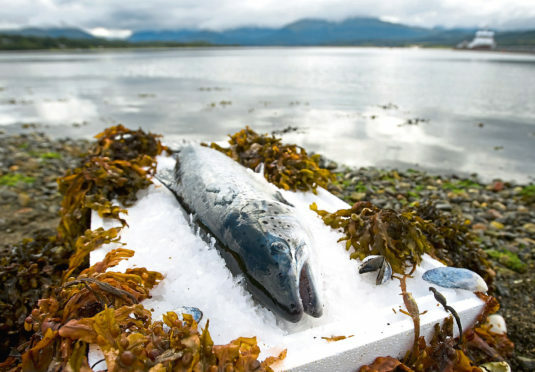 Scottish salmon submitted image: Salmon on ice. Official figures show the value of Scotland’s exports beyond the UK to the rest of the EU grew by £1.7 billion in the year after the Brexit vote. Sales to other parts of the EU besides Britain increased to £14.9bn in 2017, a 13.3% rise on the previous year, the Scottish Government said yesterday. It was the biggest area of growth for Scottish exports globally, with the overall figure – excluding oil and gas – up by 6.2% to £32.4bn. Exports to the rest of the UK were also up, by 4.6% to £48.9bn, confirming England, Wales and Northern Ireland as Scotland’s main outlet for trade. Sales to the rest of the UK made up 60% of the total exports from Scotland, with the EU and rest of the world accounting for 18% and 22% respectively. Produced by Scotland’s Chief Statistician, the figures provide estimates of the cash value of Scotland’s exports of goods and services, by industry and destination in 2017. The US was Scotland’s top destination for overseas exports, with an estimated £5.5bn of sales. Scotland’s top five international markets – the US, the Netherlands, France, Germany and Ireland – accounted for £14.3bn, or 44% of overseas exports in total. Food and drink exports beyond the UK were up by £455 million, or 8.4% to £5.9bn, with strong whisky sales – worth £4.4bn in 2017 – underpinning the total. There was also a strong performance for the manufacturing sector, driven by growth in the export of refined petroleum and chemical products, with an increase of £915m (35.6%). Economy Secretary Derek Mackay said rising sales would be “supported even further” by government action, including “substantial investment to maximise the value of Scottish exports”.